I love the shade…the formula, a little less so. It’s thick, but it doesn’t spread out and smooth once applied, so brushstrokes are highly visible. Six red or pink colorants, usable as eyeshadows or blushes. Angel Wings is a little pale for a blush, for my preferences; and it doesn’t have a ton of shimmer, so you’d have to add that to get Angel Wings to work as a glow powder…but the other shades look like they’d make great blushes without needing another color mixed in. I think this may have the same colorshifting pigments as Enchanting, since I see blue or purple depending on the light angle. 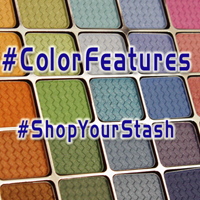 The color is mostly blue, with occasional changes to violet or teal. The color is a little lighter-weight than the Premiums, but I still get decent coverage. One of the smaller spectrums of colorshift in the Premiums collection (the smallest is Captivate, that’s just…different colors of blue.) It definitely looks better when foiled! The finish is smoother, and the colorshift is a bit more visible. This was one of the first of these that I had - because it was in the set that I bought on sale. The application is about on par with the rest of the “vamp” colors - it can be a little bit uneven, and because it’s such a dark shade, that unevenness is more noticeable. It’s an attractive color, it’s just not a shade that I personally reach for. Mystical covers the cool end of the spectrum pretty thoroughly. The purple shows up more strongly at extreme angles, and when it shows up it’s a rich violet.